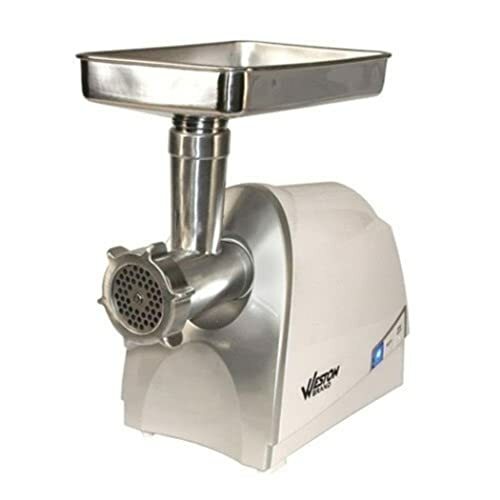 Weston 575 Watt #8 Electric Meat Grinder is a powerful tool in creating home-made sausages and fresh meat patties in a short period of time. This machine uses a reliable 575 watt power that creates up to 3 pounds of meat output in just a minute. Whether you are grinding pork, beef or poultry, this heavy-duty machine delivers. Unlike other electric meat grinders, assembly is pretty much a no-brainer. To disassemble the machine, remove the grinder hopper and the stomper included, press the release button found right above the chute and then turn the head clockwise. Do the reverse when re-assembling it – put the chute and turn it counter-clockwise and then attach the grinder hopper and the stomper. You get to choose from three different meat plates – fine, medium and coarse. It also includes accessories such as a grinding knife and sausage stuffing tools (sausage star and sausage funnel). What’s great about this is that you can all fit the accessories in the meat stomper – perfect if you can’t be bothered with tidying things up after use. When using your Weston 575 Watt Electric Meat Grinder, make sure you cut the meat into small cubes first. Place everything on the meat tray and use the stomper to fill the grinder chute with meat. There’s a switch at the side of the machine you can use to turn it on and begin grinding. Since this electric meat grinder has three cutting plates, you can easily choose the coarseness you want for your meat. You can also make delicious sausages with this. After grinding your meat, season it with the herbs and spices you want. Remove the cutting knife and plate and replace them with the sausage stuffing star and then the funnel. Turn the knob to secure the funnel. Place your seasoned ground meat on the tray, insert the sausage casing in the funnel and use the stomper to push the ground meat. Meat should come out easily from the funnel into the sausage casing. Once you have achieved your desired length, twist the casing to seal it and then proceed to stuffing it once again. Make sure there are no empty spots. Adjust the meat as needed before stuffing it again. The process is so easy and doesn’t take a long time to finish. Looking for a helping hand in the kitchen? The best electric meat grinder! Who is Andrew G.Hopkins ?